Die cast medallion base with decorative border. Full color printed insert. 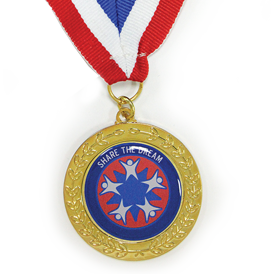 Choice of gold, nickel, or copper plating attached to 1" wide x 30" red,white,blue polyester ribbon. 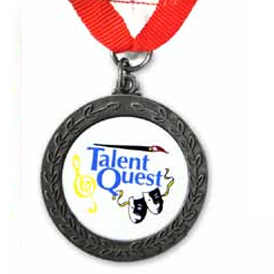 Decorative Cast base medallion with full color printed insert. 1" x 30" red, white, blue striped polyester ribbon. Choice of gold, nickel, or shiny copper plating. 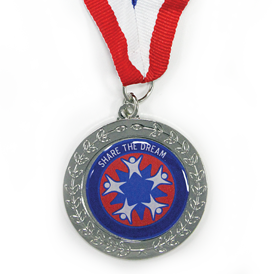 For an epoxy dome on 1-1/2" size medallion add .30(C). For 1-3/4" size add .40(C). For 1-3/8" wide ribbon add .80(C). Antique finishes available for additional 1.00 (C). Please add 2 weeks to production time. Printing on ribbon is available. Please contact for details. Adds 3 weeks to production time. 50.00 (G) sample charge only refundable when order placed. Add 1 week to delivery time. 5 DAYS after artwork or sample approval.